Welcome to block of the month, we are starting a quilting project that will go from December 15 of 2018 to December of 2019. Each month there will be a new block that will entice your creativity or piecing and applique (wool applique). These blocks can be joined to form one quilt or could be used individually. You sign up each month and if there is a month you don't like or can't do you don't have to sign up. It will be a new block technique each month. Check out May. Learn to knit a short sleeve sweater over 5 half day sessions. This class starts Monday April 1 and it is from 9:30 - 12:30 every Monday in April. Sweaters can be fun and a great way to show off your knitting talents. If you are just learning to quilt, one of the easiest quilts to learn on is, the Log Cabin. You will learn rotary cutting, piecing, squaring-up, basting and binding. Plus a few other fun things. River rocks can be make into a table runner or a large quilt. Learn the technique with the studio 180 ruler Split Rects ruler. The class will make a table runner however the you can purchase the pattern to make the quilt. This quilt is a great wall hanging or could be adapted to a lap quilt. it Shines like a Big Star. This Is a wonderful beach bag or even everyday bag for those who have lots of thing to carry. It is easy to make and fun to use! the first day is half day with lots of homework and the second day is complete day to finish off bag. Learn to create wall hangings, table runners, add design to quilts, and many other things that have wool applique. We have a wool mini's club on first Monday of every month but this class gives you the ability to learn basic stitches and concepts to wool applique. Embellish your work with wool. Kit is included in price. Get together with a group of other knitters and get help with a project you are working on and learn a few new trick in the process! 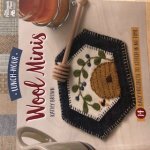 Follow along with the Wool Mini Create a Beautiful Wool Mug rug or wall hanging that will truly make you smile. This is a monthly offering that you can take as it fits your schedule or your liking of the monthly project. Wool applique is addicting so watch out, the mini's will get you hooked. What was once a lost art, Needle Tatting is making its way back. Come learn the basics of this fine weave. Tatting is creating a form of lace in rings and chains. There are two ways to Tat, one by shuttle and the other by needle. This class is to start to tat with a needle. Please join us and take up a new hobby. ShippenStitch is proud to host "Love Your Feather Weight" That will be presented by "The Machine Lady". The Machine Lady is from Pittsburgh PA and has been servicing old sewing machines and featherweights for a long time. The Machine Lady is Kathy Farra. Kathy will be teaching you how to disassemble, clean and reassemble your featherweight. The Class will include a Kit to Service your machine. She will have some specific featherweight products as well to purchase. This bag fits a ton of stuff and is sturdy and uses tubular stays. This is a one day class and you are to come with your pieces cut and ready to go. It is a great bag to add cork or texture to the bottom. If you enjoy machine embroidery then this is the club for you. In this group you pick your design and work independently while having an instructor to help if you get stuck. This multi directional scarf gives a glamorous look to your everyday clothes. It is fun to wear with any kind of outfit. Fun and easy to make. It is two half-day class. This is a Judy Niemeyer Pattern that will be taught over 5 months. It will be the third Friday of every month from January18 2019 through May 17. Need a clutch to take with you, and you don't want something large and hanging then this is the bag for you. Use scraps or your favorite fabric and carry in style. The bag looks awesome with some cork fabric. Bright colors adds to this fun table topper / runner. Multiple steps put together an interesting design of fabric called the Bargello quilt. In this class learn the technique and create a table topper or runner to brighten your living space. This could also be used as wall hanging. The steps are similar to making a large bargello. We have seen applique all over in quilting but rarely do you see Reverse applique. Come learn a technique to reverse your applique. The applique can be done on machine or by hand. In this class you will be picking one of Laura Heine's Collage patterns and be taught how it will all go together for that beautiful wall hanging you always dreamed about. Class requires the purchase of one of her patterns. this beautiful paper pieced wall hanging gives you a good foundation to paper piecing. It is a two day class that has some homework but mostly done in class. Pick your fabric and shine up a room. What is a bag/purse without a wallet. Learn to make a wallet to go with your handmade purse or any purse. The Necessary wallet has multiple compartments to keep things organized with a quilters touch. A beautiful rendition of potted Lily in bloom. This quilt requires some Deb Tucker Rulers which are available for purchase. It has split flying geese and some applique. t?s not too soon to think about knitting Christmas gifts! Learn how to knit wool slippers and felt them in your washing machine. Students will need ?Fiber Trends-felt Clog? by Bev Galeskas pattern. Available on Ravelry. Choose a classic low heel, or a higher, more closed heel. Soles can be joined with a ?bumper?. Can be knitted with 1 or 2 colors, also a variegated yarn looks really nice when felted. Yarn requirements: 550-850 yds, depending on women?s or men?s sizes. These clogs are knit with a double strand of heavy worsted weight wool. How cool to make a Pineapple express quilt. This quilt can be done a variety of ways however this class is going to use the Pineapple express ruler by creative grids. Multiple colors or limited colors either way make it exciting to see how the design turns out. Join us for this fun, creative class. This multi zippered pocket bag is great for lots of things. Especially good organizer for sewing gadgets or when traveling. Learn how to put zippers in multiple times.